Watergate’s theme of secret government is a common thread throughout Woodward’s career that has spawned 19 books – all national bestsellers – 13 of them #1 – more than any other contemporary nonfiction author. His 19th book, FEAR: Trump in the White House (published on September 11, 2018), and has sold over 2 million copies - his bestselling book ever! In the process, Woodward became the ultimate inside man. No one else in political investigative journalism has the clout, respect, and reputation of Woodward. He has a way of getting insiders to open up – both on the record and off the record – in ways that reveal an intimate yet sweeping portrayal of Washington and the budget wrangling, political infighting, how we fight wars, the price of politics, how presidents lead, the homeland security efforts, and so much more. His work is meticulous and draws on internal memos, classified documents, meeting notes, and hundreds of hours of interviews with most of the key players, including the president. 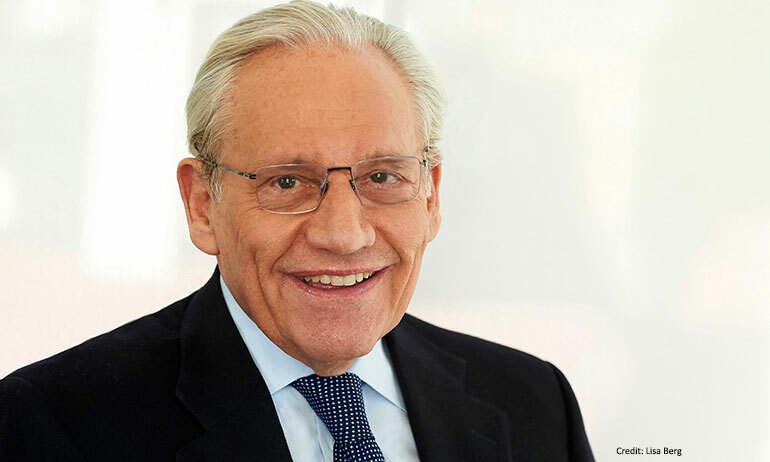 Professionally, Bob Woodward is currently associate editor for The Washington Post where he’s worked since 1971. He has won nearly every American journalism award, and the Post won the 1973 Pulitzer Prize for his work with Carl Bernstein on the Watergate scandal. In addition, Woodward was the main reporter for the Post’s articles on the aftermath of the September 11 terrorist attacks that won the National Affairs Pulitzer Prize in 2002. Woodward won the Gerald R. Ford Prize for Distinguished Reporting on the Presidency in 2003. Woodward's most recent accolade -- being named to the Vanity Fair 2018 Hall of Fame. Woodward was born March 26, 1943 in Illinois. He graduated from Yale University in 1965, and served five years as a communications officer in the U.S. Navy before beginning his journalism career at the Montgomery County Sentinel (Maryland), where he was a reporter for one year before joining the Post. Everywhere legendary journalist Bob Woodward goes, he says people ask to know what’s really going on in Washington. Their questions fall into four categories: (1) The presidency: How is President Trump doing and surviving? How does Trump compare with the eight presidents – Nixon to Obama – that Woodward has reported on for The Washington Post and in his bestselling books? (2) The investigation of special counsel Robert Mueller: is it like Watergate or will it fade away like Reagan's Iran-Contra scandal? (3) Conflict: What is the likelihood of a new war? What are the goals with North Korea, in the Middle East, with the Islamic state, and on terrorism? Will there likely be a major escalation in one of the current conflicts? and (4) The economy: Is the American/global economy sound or are we headed for trouble? How is Trump’s America First agenda playing out with our allies and enemies around the globe? In 2014, Robert Gates, former director of the CIA and secretary of defense, said of Woodward, “He has an extraordinary ability to get otherwise responsible adults to spill [their] guts to him . . . his ability to get people to talk about stuff they shouldn’t be talking about is just extraordinary and may be unique.” That is Woodward’s true gift, and audiences at his speeches leave transfixed by what they’ve learned.